This year’s Mobile World Congress is starting to look like an oldies tour. It’s a time-honored tradition in pop music for acts long past their prime – some with only a few of their original members – to play a few of their greatest hits at state fairs and other cheery venues. As one star of a bygone era leaves the stage, the next takes over. On Sunday, for the second time in two days here in Barcelona, a licensed manufacturer introduced a handset bearing a venerable phone brand that evoked that company’s glory days. Following BlackBerry’s introduction of the KEYone, a smartphone from partner TCL with the familiar physical keyboard of BlackBerries past, Nokia licensee HMD Global launched a (slightly) modernized version of the Nokia 3310, a rugged, beloved feature phone first introduced in 2000. Though it came at the tail end of an event where HMD announced upcoming global availability of its Nokia 6 and two new lower-end models, the 3310 drew the most interest. It stands out in the age of slab-like smartphones for its curvaceous shape and old-style numeric keypad. 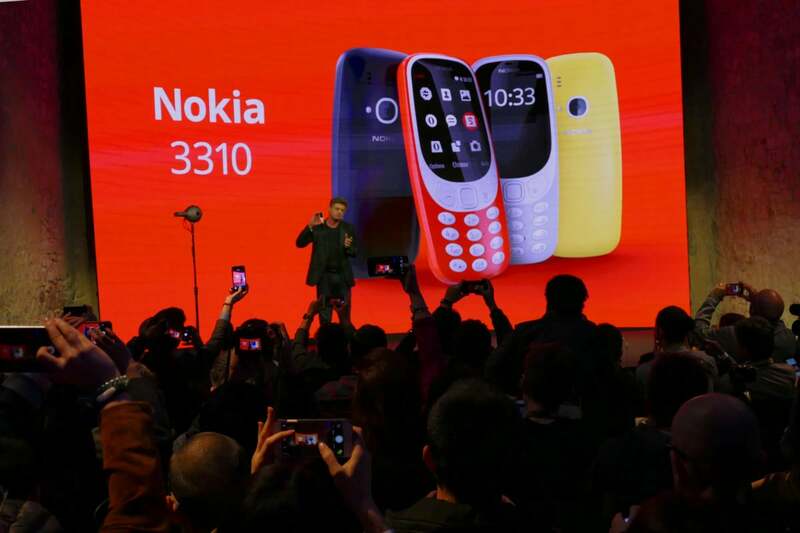 The new 3310 also has essentially the same user interface as the original, with menus, a selector, and navigation keys that will be familiar to millions of users who once had Nokia feature phones. But the screen is larger, covering the top half of the phone’s face, and in color. Snake, an early Nokia phone game, is back and in color this time. The phone’s body will come in bright yellow and red glossy versions as well as matte blue and matte gray. Battery life will be a key selling point for the new 3310. It’s good for up to 22 hours of talk time and 25 days of standby. Price will be another, at least in developed markets. The average global retail price will be 49 euros when it goes on sale in the second quarter, according to HMD. The smartphones HMD introduced on Sunday are likely to be the Finnish company’s real bread and butter. The Nokia 6, a midrange phone with a 5.5-inch display and a 16-megapixel back camera that went recently went on sale in China, is set to go on sale globally in the second quarter for an average of 229 euros. A special piano-black version with some other perks will cost 299 euros. It’s also getting two smaller siblings, also coming in the second quarter: the Nokia 5, a 5.2-inch device with a 13-megapixel back camera priced at about 189 euros; and the Nokia 3, with a 5-inch display and an 8-megapixel camera, for about 139 euros. They’re the first Nokia phones with Android, and it’ll be a “pure” Android, with prompt updates to each new version of the OS, along with regular security updates. Google Assistant is included with all three. HMD promoted the design and quality of its smartphones, saying each was made from a single block of aluminum. It even showed an Apple-style manufacturing video with a mellow, British, Jony Ive-like narration. But at the end of the event, the biggest crowd in the hands-on section gathered around the 3310.